Stamford Bridge Stadium is home to Chelsea Football Club and has a great capacity of nearly 42,000, making it the eighth largest ground in the Premier League. Naturally, with such a large capacity, they see millions of people pass through their doors every year and have a host of food vendors, bars and cafés to cater to them all. The client contacted us here at Garment Printing for an express order which needed to be printed and shipped out in two days. 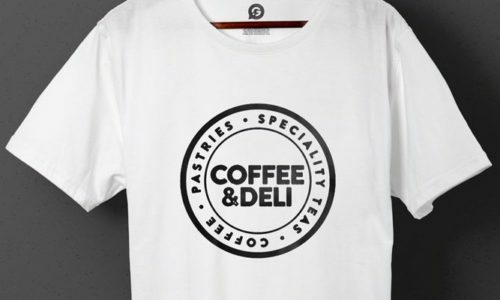 The client was in charge of ordering personalised workwear for all the food vendors around Stamford Bridge stadium. They needed 150 black T-Shirts with six different designs, one for each of their different food outlets. They required a quality T-Shirt and a durable print in order to make a great impression on the public. There was no margin for error with such a tight deadline, however we regularly receive orders like this and pride ourselves on being as efficient as possible. The challenge for us on this job was that the client needed to see a sample of each before she went ahead with the order. This isn’t possible with screen printing, as the screen set up fees are very expensive. We could have easily sent a sample out using a different printing technique, such as vinyl or transfer, but this wouldn’t represent the final screen printed design. Of course, we managed to come up with a solution and give the client what they needed. We opted for screen printing for this job, as it gives a top quality print and is very durable in the wash, which is essential for work wear. We chose the Gildan GD01 T-Shirt because its price, colour range and quality cannot be matched. As the client wanted a sample, we came up with a solution that was risky but effective. It required a team effort from the entire chain of production, from the sales team, through the production line and even including the client herself. As each design went to print, the production team took a photograph of the first print to come off and paused production. This was then emailed to the client who approved each one before we continued. The challenge here is that once production has started, it’s difficult and costly to stop, so the time window was literally 5 minutes. The client was on call to receive and approve each photo as they came through and it worked very smoothly. We delivered the T-Shirts on time and they looked flawless. Claire was extremely pleased with our speed, precision, customer service and, of course the printing. “Thanks so much, they are perfect, really good quality, I really appreciate all your help and patience. Thanks again.” – Claire, PA to General Manager and Deputy General Manager.